My Malibu has been around in my family sense it first came out, so for about 14 years. When I am driving it's a very smooth and quiet ride, very spacious, comfortable seating, nice detail work on console and dashboard, a/c is strong. If you ever get into an accident the frame of the car is very strong. I have gotten into a few fender benders and still no dents on my car. If you plan on driving for long periods at a tip this car is very good on gas mileage, I have to refill my tank once about every 1 1/2 weeks. Sound system is good, very loud really good base. Some of the negatives to this car would be that the a/c fan tends to get clogged of u do not clean your hood from leaves, twigs, and so on. It does not come tinted so if u live somewhere it's hot you have to get it tinted, that could cost u anywhere from $80- $120 per window. Also if you live in the heat u would want to cover your car case in the heat of the sun the front seats to bubble and chip/peel off. The hole interior is fabric / carpeted, so if u have kids super prone to stains, and super outdated prints in the seats. The tail lights tends to collect moisture and get water in them and ruins the wiring, or u have to constantly change then bulb. And last but not least the doors are very heavy u have to use like all your might to open and close the door, and when you close the door you have to slam it closed, its very annoying. Amazing gas mileage both in town and out of town. I love my car. It gets good gas mileage. I only have to fill it up every other week and it only cost $25.00 to fill. She drives so smooth and is very easy to handle. I have had her for 4 years now and have only had to replace the tires and the bulbs for the blinkers. The only thing that I would change about her is I would add heated seats, I live where it snows, and a wiper on the back windshield. The trunk space is way bigger than it looks on the outside. She seats 5 safely. There are cup holders in the back as well as the front. The placement for the cup holder for the driver is amazing. Its to the left of the steering wheel. Way easy and safe when driving. My Chevy Malibu is a little outdated but it's actually pretty comfortable. 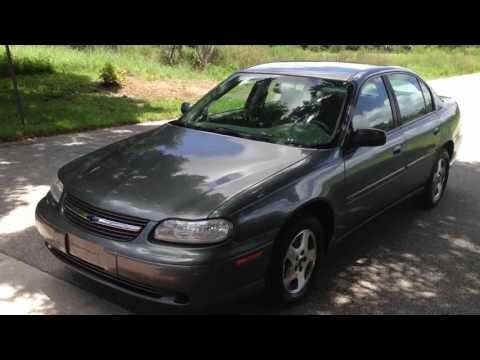 As much as I like a more updated vehicle with plenty of technical features, my 2003 Chevy Malibu is not terribly far off track from any newer vehicle on the market today. The speakers are actually very loud and clear for a car from 2003 but not as bassy and crisp as a new vehicle. It is very quick on the gas pedal which makes this car far more fun to drive. It has very bad gas mileage though. In all honesty. This car is definitely fun to drive if you do not mind it being a little older.